The choir sang 4 songs. The mayor of Newcastle was there. The Rotary club gave us a cheque for £150. LMW Community choir teach us a new song. New Light is about Stoke's 6 towns. This Little Light of Mine is part of the song. Ben introduced us to electric instruments. He played the electric drums. We sang songs and he played the guitar. Y5 Stafford County Showground Manchester Camerata concert. Conducting whilst playing the keyboard! Coaching from more experienced flute players. We lead a singalong in the Bistro today. Mrs Kurat always supports us. CHOIR AT ROWAN COURT CARE HOME. 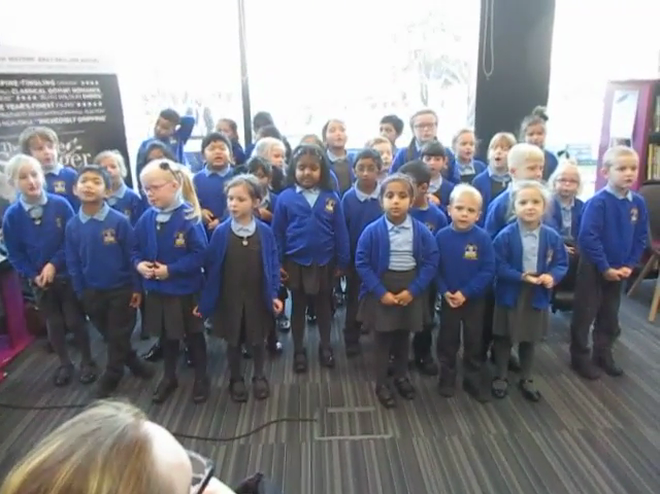 KS1 CHOIR AT NEWCASTLE LIBRARY. 39 children sang Christmas songs. CHOIR AT ST. GILES DALEIAN SINGERS CONCERT. 28 children sang 6 songs brilliantly! The men sang a clever version of Jingle Bells. We added flossing to Rudolph. We performed 2 songs together. We shared our folders with the group members. We shared out our jingle bells. Lots of people joined in. We enjoyed refreshments together afterwards. Rehearsal time. We worked very hard. We took 26 children- a credit to the school. We had 19 children in our Orchestra. This included descant and treble recorders. Our woodwind included a saxophone. Victoria Hall conductor rehearses with the choir. Singing with the Approach group. Mrs Kurat loves to sing. Mrs Crofts comes and helps us too. Accompanied by the guitar and ukulele. Everyone accompanied the songs with percussion. KS2 Choir perform songs by Martin and Shan. 15 pupils from Y4 played and sang brilliantly! We sang lots of well-known songs. Waving our flags and singing Rule Britannia! We enjoyed the John Fisher Orchestra. We popped next door for a singalong. The Approach group members joined in. We sang some funny songs. Showing our parents how to strum. We used the Charanga website. We showed our parents how to play. We made a great recorder ensemble. It has 4 holes besides the mouth-piece. Even our parents found it hard! We played "Merrily we Roll Along"
We played " London's Burning" from our book. We sang "I am a Music Man"
We played 4 different percussion instruments. We even reversed the verses! Year 2 Test Driving PBuzz Instruments! We can get a sound out of them! Newcastle Male Voice Choir came to sing for us. With conductor Hannah and accompanist Anne. They sing in 4 part harmony. We learned to sing a hymn together.